Innovation is widely recognized as a central driver of economic growth and development. The Global Innovation Index (GII) aims to capture the multi-dimensional facets of innovation. India improved its innovation rank to reach 66th position from 81st (in 2015). This improvement in India’s rank came after 5 years of continuous drop in its ranking. Recognizing India’s potential to reach great heights in innovation and creativity, a Task Force on Innovation was set up on the directions of Ms. Nirmala Sitharaman, the Commerce & Industry Minister, Government of India. The Task Force on Innovation had the mandate of assessing India’s position as an innovative country, suggest measures to enhance the innovation ecosystem in India and thus improve India’s ranking in the GII. The Team, comprising of government officials and experts from private organisations & academia, has come up with its report which gives specific measures the measures to improve India’s rank. The report comprises recommendations and suggestions to improve India’s rank on all 82 indicators mentioned in GII 2016 report. It also points out the national and international models, programs or schemes which may be adopted and/ or replicated and scaled up to further improve India’s position in a particular indicator. In addition to this, the report analyses the methodology used in GII-2016 and calls for a need to re-examine and suitably modify the methodology in order to reflect true position of countries. 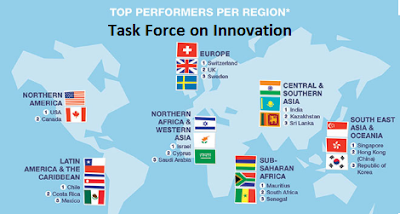 Report on Global Innovation Index: An Indian Perspective - Task Force on Innovation The Global Innovation Index (GII) aims to capture the multi-dimensional facets of innovation. India improved its innovation rank to reach 66th position from 81st (in 2015). This improvement in India’s rank came after 5 years of continuous drop in its ranking.